Jane is TseK’ehne First Nations from McLeod Lake, BC. Her mother was Lena Inyallie and her father was Walter Solonas. 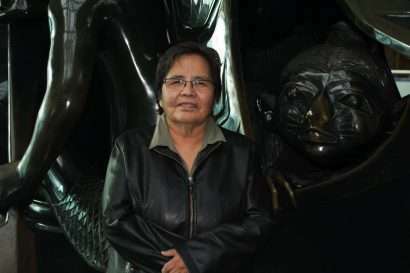 Jane was born in Prince Rupert BC, and lived in McLeod Lake with her Mother Lena, Maternal Grandmother Harrieta A’Huille as well as her Paternal Grandparents Monique and Theodore Toodick; and other Elders and extended family in McLeod Lake. She later moved with her family to outskirts of Prince George. Jane attended Lejac Residential School, McLeod Lake and Nukko Lake Elementary Schools, Kelly Road and Prince George Senior Secondary Schools. She later attended the Enow’kin School of Writing in Penticton, BC. In the 1980’s Jane began writing poetry as a way to facilitate her process of healing. Her poetry has been published in , ‘Gatherings’, ‘Shadows’ Past and Present, and ‘ReCREATIONS’ Religion and Spirituality in the Lives of Queer People. She has self-published a chapbook called ‘A selection of original poetry by Jane Inyallie’.